Throughout my career as a Business Intelligence Consultant, I have met and interacted with a lot of DBAs. One thing (among many others) I particularly admire about them is that they have their own list of SQL scripts that they carry with them from job to job (and my observation is that the list usually grows with experience). This way, they don’t have to remember all of them, but when the need arises, they have the scripts at their fingertips. The only thing I have close to that is my list of custom codes for doing some specific operations in SSRS. 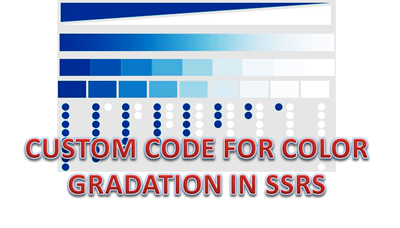 One of my most frequently used scripts originates from this series of posts on how to conditionally color in SSRS. Based on my needs, I had tweaked the code such that it will display the color gradation to white for any input color. Thought that this might come in handy for some of you guys. 2) You can either compile this code and use it in your report or just paste it in the code tab of the Report Properties. If we just need to get different shades of a color (say #2322EE), we can just use the expression below as the BackgroundColor property of the cell. 3) If you need the color gradation to be based on each row, then make sure that the max and min values are passed for the row (in this case, the Vehicle group) rather than the whole dataset. Just make sure that the colors in the palette are using the hex values and not just strings like “Red”. Note that we are writing a conditional expression to see if the current field is more than the mean (max+min / 2). If yes, then we use the familiar expression with the Blue color (so more the value, darker the blue). If no, we need to do add a negative for all the fields so that the coloring happens in the reverse order (lesser the number, darker the Orange). You can keep on tweaking this code and use it for a wide variety of visualizations. I am no VB.NET developer, so it is possible that there is a much better way to do the same. If you do know of any better technique, do post in the comments so that others can benefit from it. in which function "#2322EE" is passed as argument??? As ColorDWB function accept 4 arguments..
Hello Jason. This is an excellent solution. I have it working in my report, but I am dealing with negative numbers in some cases, where the more negative, the more color needed. Your code is doing the opposite. I have tried about 20 different variations, but nothing is working. If you have a spare moment, I would greatly appreciate your assistance. Point 5 deals with such a scenario. If you look at the expression for the Orange color, you can see that the color gets darker the more negative the number gets. I just use the first parameter as -min and then second parameter as -mean. This would ensure that the more negative number becomes positive, and then it becomes the max value. Hi, I've tried using your code above, but the coloring stops at the value 255.73 for me. I have 2 columns, 12 rows and the bottom 4 are graduated colour gradients but the top 8 are all white. What am I doing wrong? The values range from 794 to 88…but only 88, 106, 144 and 255 have colours. The rest are white. Help please. Might depend on the range. If your lowest numbers are really far from the other higher numbers, the color will be closer to white I guess. For eg, in step 3, the column 4 of Trucks is white. You can change that behavior if you want in the code (like changing the 255 to something else so that it will not be white). If that is not the case, you might want to try displaying the output to a textbox and debug what is going on. Thanks Jason. As these are live sales values, the split is now (MIN) 106 and (MAX) 794. Would you say thats too wide a split? I'm getting the below in the output debug window…. [rsInvalidColor] The value of the BackgroundColor property for the text box ‘Commision_Amount’ is “#FFFFFE38FFFFFE34C8”, which is not a valid BackgroundColor. What could cause that? I also tried to replace in EG.3 the 'vehicle' with 'executive' but it didnt like that which im confused as thats the dataset1 value name. Send me an email at jason143@gmail.com with the dataset query + output of the dataset, the custom code, the report layout as well as the code you are passing there. I will take a look and let you know what is wrong. Love this code!! Thanks so much for posting!! Thanks much for the code…I have to implicate the same in my report… Will this work in 2008 R2?……because I'm getting an error " the background color expression for the text box " " has a scope parameter that is not valid for an aggregate function. The scope parameter must be set to a string constant that is equal to either the name of a containing group, the name of a containing data region, or the name of a data set." Thanks SQL_Jason..for such a nice code to capture color variation…Really appreciate. I am facing one issue after implemented the different color gradation, When rendering the output on excel, it is displaying BLACK color for many Rows\Columns. Could you please suggest any solution. Same here. It is MADDENING. It does not matter what colors you use. What is interesting is that one cell that was blacked out yesterday when i generated the report and exported to Excel is shaded as expected today. System.Web.Services.Protocols.SoapException: There is an error on line 7 of custom code: [BC30037] Character is not valid. Hi I am getting a similar error. Hi, It’s to do with the (re)formatting of the code. Several characters have been auto formatted into illegal characters such as curly quote marks and long dashes. I need to have Green color for positive values – (Darkest Green to Lightest Green ) and Red Color for Negative Values – (Darkest Red to Lightest Red). I found that if you copy and paste the code, you will receive this error, but if you type it all manually, you do not. There must be a hidden character in there somewhere? Does anybody know how to get this script to work with lower values? I have a matrix where the values in each row group could possibly vary from between 1 and 8. When i run the background expression for these numbers there is no shading and it’s all white background.